I recently ran into the composer Tim Nelson at a lounge in Budapest. He had with him a viola case and another contraption that resembled something like a cross between a slide whistle and a circular saw. Naturally i joined him. He has outstanding tastes in bubbly. He also has a new record out, Pellucidity, and i’d been meaning to ask him about it. Koniuto: Thanks for taking the time to chat with me. I’m itching to ask about your recent release, Pellucidity. I’ve been listening to your solo music for many years now and this is something new and exciting—to say the least! It’s new, and yet you, as it were. But first, i’d like to get some background, some context for this new music. Is that OK with you? Koniuto: You and i are connected on a couple of well-known social networking sites. There are numerous photos over the years featuring a certain musician in different settings sporting varying amounts of hair, and he’s often but not always attached to a guitar. Can you clarify for us how long you’ve been playing and composing, and in what contexts and genres—basically what brought you to the last decade or so of such interesting solo music? In other words, where have you been that one might never guess having listened to your most recent releases?—and were you, in fact, as rumored, the sixth Beatle? 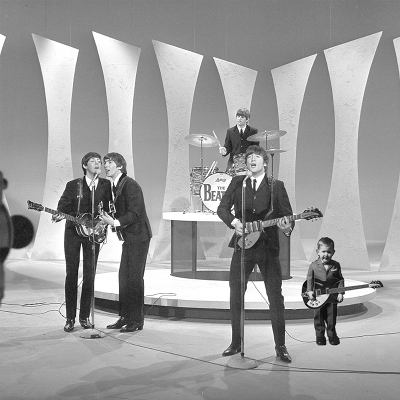 tn: I hate to be the one to break it to you, Peter, but I’ve never actually met the Beatles, although I was indeed born midway between their first two recording sessions, right around the exact time Ringo replaced Pete Best, and I learned my first guitar chords with a week left to go in 1969, as the Beatles were disintegrating, so I guess there’s at least a kind of symmetry there. But, yeah, it was a pretty typical path for someone of my generation, playing guitar and bass in various bands with continuously shifting lineups of friends. I did play trombone for a little while in elementary school, but for the most part stuck with what my peer group saw as the “cooler” instruments. As far as composing, I’ve been making it up as I went along for as long as I can remember. The line between improvisation and composition has always been a little fuzzy for me. Koniuto: And Little Red Hen-like, you’ve taken on building your own instruments. How did you become interested and skilled in luthiery? tn: Well, I’ve always been interested in building instruments, but I wouldn’t say I’m particularly skilled at it. They’ve been pretty crude, and it’s been mostly out of necessity that I’ve even made the effort. I’ve built a few instruments that would have been prohibitively expensive to buy, or took the steps necessary to make the cheap ones playable. But most of my projects have been attempts to come up with something to suit a specific requirement, things that would never be available prêt-à-porter, usually just small modifications or combining features of two or more instruments into one new thing. But you did mention earlier that I’m often but not always associated with the guitar, so I should probably point out that there’s been no guitar at all on the last few albums. Koniuto: Is this abandonment of the guitar because in the early days of your musicianship—in bands and such—you considered yourself a rock musician, and now your music has become something very different from rock, albeit informed by your past? tn: Not really. I don’t think I’ve ever, certainly not consciously, really defined myself by the genre or the context I happened to be playing in at any given time because I’ve always listened pretty omnivorously, much more eclectically than anything I’d ever want to do in live performance or on a recording and I’ve always been more interested in the terra incognita out on the periphery of any genre rather than anything more unambiguously representive of, say, “rock” or, to use even more entirely meaningless labels, “jazz” or “classical”. I say “meaningless” because there are so many different approaches and styles that can be lumped together under those terms that really have nothing in common more than maybe sharing the quality of not being something else. And even in rock bands, I always sort of gravitated to the role of being the guy who’d bring the more eclectic elements to the table. Koniuto: We’re on the cusp of adding the term “avante-garde” to that list, which is too bad because there are some real trailblazers out there who hang out at the very edge and push it even further out. But most who picnic happily under that umbrella term—well, it’s almost as silly as the use of the term “alternative” became to describe a genre, but on a smaller scale. You’re right, there’s in-group / out-group psychology going on there, to say nothing of the potential economic benefits being identified one way or another. tn: And also, out on the margins of a genre where it’s a lot less clear what’s what, the juxtapositions can be much more interesting. In many ways I identify most strongly with the very opposite of the types of juxtapositions we’ve seen already. If you combine specific features of jazz and rock, for example, “fusion” is really just one of many possible results, depending on what qualities of jazz and rock you choose to focus on. 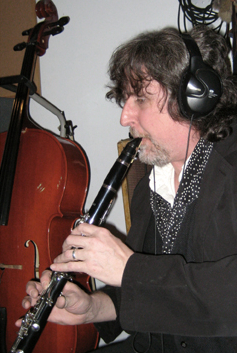 Or more apropos to my last few recordings, combining elements of less traditional recording techniques more usually associated with rock or jazz but with instrumentation more consistent with symphonic music doesn’t mean it has to sound like Electric Light Orchestra or Emerson, Lake and Palmer. Or even Walter Murphy’s “Fifth of Beethoven”. If Jimmy Page could use backwards reverb on an acoustic guitar, like he did on ‘Bron-Yr-Aur’, I see nothing wrong with extending the technique to a cello or a clarinet, although a purist would never, ever do that, or something like running a viola through a Leslie or throwing heavy tape echo on a harpsichord. Koniuto: It’s a great tool for the composer, though—that level of engineering. Backwards reverb on wind instruments is never going to sound exactly like that synthesizer factory preset that a thousand other people are using. tn: Actually, you’d be surprised how many people hear that and ask me things like, “What kind of synthesizer module do you use?” and I have to go, “Uh, no, that’s a cello….”, or a clarinet, or whatever. I guess it’s because there’s traditionally been a huge divide between the worlds of classical and popular music where the goal of the engineer in classical music has been to present an instrumentalist as accurately as possible, while in other styles of music all sorts of “studio trickery” is allowable, like using delays and non-realistic amounts of reverberation. In a lot of ways our generation is a sort of melting pot for all those disparate styles… I see it as just a part of musical evolution. But if you’re implying there’s somehow a stigma attached to someone trying to move to more “serious” music from somewhere like rock, you’re probably right, although, again, I’ve never really identified myself with either camp, and I don’t really care about distancing myself from anything. Koniuto: Still, cinematic and painterly use of the guitar has certainly influenced your compositional ear, yes? tn: Oh, absolutely, without a doubt. But that could be said for any instrument, really. Koniuto: The last time we saw each other was at a David Torn performance in Cambridge, MA in late winter 2008. There are parallels. Before we move on i’d like to hear a little more about Tim Nelson the guitarist because i think it may unveil some things about Tim Nelson the composer. tn: I’ve always had a sort of love/hate relationship with the guitar. I mean, it can certainly be an extremely versatile and expressive instrument, and in the hands of someone like David Torn it’s just amazing how many completely distinct timbres can be wrangled out of it. Jeff Beck has been fresh and original since the mid 1960’s and I don’t think he’s running out of ideas. But compositionally I’m finding more and more that it’s just not a voice I’m interested in writing for. I haven’t exactly abandoned the guitar and it’s still usually close at hand when it comes to live performance, if only for the convenience of plugging in something familiar on which I might be just slightly more competent. But, to go back to your question about genre and chronology, the roots of the music I’m doing now were there a very long time ago. As a teenager I was, like a whole lot of people, very much influenced by guitarists like Jimmy Page, Jeff Beck or David Gilmour and that continued as I played in prog-oriented groups where, depending on what instrument I’d be playing, you might be able to pick out the influence of bassists like Chris Squire or John Wetton, or keyboardists like Richard Wright from Pink Floyd, Tony Banks from Genesis or Peter Bardens from Camel. But at the same time, this was at an age when I was very quickly discovering a whole world of composers. From Stanley Kubrick’s films I first heard György Ligeti and Krzysztof Penderecki, composers who continue to be hugely influential to me today. I read an interview where Frank Zappa mentioned Edgard Varèse, so I checked him out, and Stravinsky. It was around this time that I first heard Mahler’s 10th Symphony, where at one point—in what is basically a meditation on mortality—the music comes to a point of calm and stillness where it’s as if Mahler is resigned to what must be, accepting his fate but then suddenly lets loose with this huge, dissonant, utterly anguished ten-note chord. That’s powerful. None of these guys wrote very much music for guitar. And it’s probably no coincidence that this was also around the time I started writing music for films. Koniuto: I think of all of your music that i know as “film music”—even though some hasn’t been composed specifically for film. I’m curious to hear about the music you’ve created specifically for film. Are there any projects in the works right now? tn: Yes, there are, although I can’t really say much about that yet. Whenever possible, I try not to talk about creative work in the future tense, particularly when it’s collaborative, since it’s always so subject to change, but also with film music the etiquette of production essentially boils down to a situation where until a film comes out, even if the music has already been written and recorded, it doesn’t exist yet. Not officially, at least. I wrote a few dozen scores for short independent films in the early 1980’s, none of which, as far as I know, exist now. Or, rather, I’m not sure the films still exist; some of the music is still on tapes that I’ve misplaced, and every once in a while I’ll come across one and then it always seems to go missing again. Then there was, apart from a few radio jingles, a long hiatus… More recently, I was involved in a new score for Robert Wiene’s The Cabinet of Doctor Caligari a few years ago, and there was a film by Michael Santana called Her about the legend of La Llorona that featured my music whenever supernatural and/or suspenseful things were happening on screen. But, yes, the largest part of my musical output for the past two or three years has been for the cinema, which is really what I enjoy the most and when the time comes that I can talk about it, you’ve got dibs. But, without being too specific, I will say that in terms of compositional style and concept, the last two or three albums have been pointing in the same direction as the film music. That’s certainly the case when it comes to the recording techniques and the instrumentation. Koniuto: Talk about what instrumentation is turning you on right now. I can’t figure out what a lot of Pellucidity, and before that Strange Birds With Human Voices and All-Nighter, are made up of. Have you come into some serious cash to be able to hire an orchestra? tn: There’s that Red Hen again. Every instrumental performance you hear on those recordings is entirely my fault. I can’t blame anyone else, because I’m the only one there. That by itself has been a huge part of my compositional style, because working that way I’m entirely limited by my own technical ability or, more often, the lack thereof. Don’t get me wrong, I’m in no way advocating incompetence. I’m not saying the best way to make a recording is to go out and find players who have as little ability on their instruments as possible, or that it’s not a good thing for someone to devote years to becoming an expert player. But if I hear the sound in my head of a viola or a clarinet, a guitar’s just not going to do it and I’ve really grown to dislike synthesizers, at least for what I choose to do. That’s been the direction of my last several albums, starting with Mesh. Rantai doesn’t count since it’s a compilation of older material, and on animalvegetablemineral I think I zigged where I should have zagged in terms of trying to be too genre-diverse. But through All-Nighter, then last year through Strange Birds With Human Voices and now Pellucidity there’s been a definite move towards using orchestral instruments. But I still love the sound of a Mellotron, which I guess in and of itself makes me persona non grata with classical purists. There’s a certain quality of “otherness” to the Mellotron where it sounds completely unreal, but not artificial in the same way a synthesizer might be. The works of the Polish writer Bruno Schulz have been described by the critic Artur Sandauer as representing a “degraded reality” where imperfections, flaws, ordinariness, rather than being glossed over and ignored become an accepted part of the presentation. The Mellotron, to me, is exactly like that. Recordings of actual instruments degraded on magnetic tape, sounding like the music might be filtered through a deep layer of dust. Koniuto: The original players on those Mellotron tapes are likely dead now. We’re hearing ghosts. But i think the magic of the Mellotron only comes through in certain hands. I suppose largely only those musicians who have a deep respect for that instrument would even attempt to include it in what they do. What you’re describing sounds incredibly labor intensive. Lots of musicians multi-track themselves playing everything, but few making the sort of cinematic orchestral music you are while excluding synthesizers and heavily processed guitars. While listening to Pellucidity i try to picture how this came to be. Can you describe in a little more detail what this looks like?—what instruments other than the Mellotron you are using, what your recording tools and techniques are, and how you manage the ever-tricky balance of performer and engineer. tn: Hmmmm. On Pellucidity, in addition to Mellotron, I played, and I know I’m going to leave something out: cello, viola, violin, flute, clarinet, floor toms, wood blocks, glockenspiel, chimes, gong, cymbals, snare drum, some vocals… But that’s what I was talking about, bringing techniques that are used all the time in other types of music into contact with the sounds of “classical” instruments. I own one gong. I think it’s a 23″ wind gong. But through creative equalization and changing the tape speed, one gong can sound like many. By the same token, a trombone can be coerced into sounding like a trumpet or a tuba, such as on both the opening track and the finale, which were actually inspired by a conversation I had with my uncle who retired not too long ago after a career as a professor of low brass instruments. He’d mentioned the scarcity of parts for euphonium players in the symphonic repertoire, since the euphonium is generally considered a band instrument, and mentioned as an exception Leoš Janácek’s ‘Sinfonietta’. I’d never written for brass, so I thought I’d try my hand at it, although my homage to Janácek somehow reminds me instead of something Arvo Pärt might have come up with at some point very early on in his school days, and my uncle still hasn’t heard it. The finale is built around the same piece, but I figured I’d go for the full measure of bombast and indulge myself by including the giant sledgehammer from Mahler’s Sixth. I’d always wondered what the percussionist does during most of that symphony when he’s not actually swinging the hammer; is he doing a crossword puzzle? So in my piece he gets to whack the thing a bunch of times, which will put your speakers in serious jeopardy. I didn’t use an actual hammer, though, it’s a 16″ floor tom with a loosened head that I hit really hard with a gong beater and then pitch-shifted down an octave. 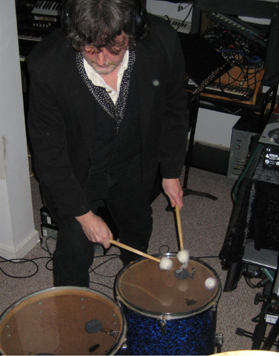 Most of the supposed tympani parts on the last two albums were actually done on a couple of ordinary floor toms. Koniuto: That’s some serious wheat grinding! So this is all taking place in your own shop. What’s your studio look like? tn: I don’t really have a proper multi-tracking setup or DAW, and still use a combination of analog and direct-to-digital on very old and obsolete software, so it’s a bit of an exercise in working within limitations. Actually, most of my inspiration comes from attempts to find creative workarounds. One mistake I made when I designed this studio, Le Croissant Fertile, was to emulate features from other studios I’ve worked in, where there’s an area for the performer and another separate area for the engineer. Here, where I do both things and can’t be in two places at the same time, I’ve gradually shifted things around so that the action is happening right in what would normally be considered the control room. Koniuto: Pellucidity is an instrumental album, and yet there is clearly a narrative taking place in the progression of these oddly named pieces. Is there a particular story line you’re following with this record? tn: Actually, yes, there very much is, but it was a conscious decision to not provide it in the form of liner notes like I did last year with Strange Birds. I usually find it helpful to concoct a narrative as a sort of temporary scaffold that supports the arc of the pieces. By fleshing it out with a ridiculous amount of detail, much more than could ever be contained literally in the work, it leads more naturally to an implicit completeness, if that makes any sense, the feeling that there might be a lot more going on behind what’s being overtly presented. The fact that it’s entirely arbitrary doesn’t matter in the least and I do have to confess that in the instances where I have presented things programmatically some of it is absolutely sincere and some of it is a bald-faced fabrication, all mixed together and I’m not saying which is which. It’s fiction, after all, even with the red herrings. tn: Certainly, and the same thing applies to the titles, because while some of the pieces are, as I’ve just described, written to illustrate some sort of hidden storyline, others emerge more as the result of recording experiments along the way and wind up serving as bridges, links to connect the other pieces. While this music is still in an embryonic form there are invariably working titles, usually nothing even remotely poetic but often just a description of the mood, the texture or the combination of instruments, simply because I need a filename to save it under as I work on it. So often these filenames that are nothing more than maybe the name of the instrument I started building the track around are then translated into a foreign language or some phrase with unexplained significance or possibly no significance at all and I’ve got a title that hopefully carries very little associative baggage. I’ll leave it to the listener to fire up their favorite search engine to see what might be uncovered. With Strange Birds, by providing concrete scenarios, even though probably half of them were entirely tongue-in-cheek, I think it fixed the scene too much in the mind of the listener and that really deprives one of the enjoyments of allowing the music to spark the imagination, to find your own personal interpretation rather than me telling you what to picture, even if I’m being facetious. Koniuto: Pellucidity is a fun word to say. I often use it in common everyday conversation. (Laughs.) I’m sure i’m not alone when i admit i had to look it up. But it is a nice sounding word—and i like title albums that sound good, as if the painting begins with the frame, or the concert begins with the program design. The book begins with the cover. tn: It wasn’t my first choice for a title, but being able to use a search engine to research these things is a double-edged sword, because I was finding every single good title I came up with had already been taken. So I ended up calling it ‘Pellucidity’ and people are now asking me if the CD comes with a thesaurus… I arrived at that title through a few converging routes, though. Part of that narrative that you asked about, and which I dodged answering, resulted in one of the pieces being titled ‘Himinglaeva’, which I’d been considering for the album title. It literally means “that through which one can see the heavens”. By then I’d already found the cover images I wanted to use, which are a couple of Wilhelm Röntgen x-rays, Crookes tube images from the 1890’s which have absolutely nothing at all to do with the story line, by the way, but I did want to zero in on the aspect of transparency and of being able to see through stratified layers. What nailed it for me, though, was the irony of one of the secondary meanings of the word, which is when it’s applied to literature or music, being direct and clear expression, free from obscurity. That’s exactly what my music is not. Koniuto: So you’re toying with us here with a bit of linguistic agonism, a little bit of slight of hand to prepare the listener once they drop the needle to know that whatever they expect, they can check those expectations back at the door? Is that the intention? tn: Many of the “rules” in music theory are designed to help a composer be clear and direct, to make music that’s easy to understand. But I noticed a long time ago that when I broke some of these rules I’d sometimes achieve an ambiguity that I really found desirable for what I was trying to convey musically, the idea of paradox. Rather than going for music that would be one-dimensionally “happy” or “sad” or “angry” or whatever, I really enjoy trying to mine the psychology of mixed emotion. So I do things like distributing the notes of different chords among different instruments, not atonally, but maybe where a major chord in one key and a minor chord in another share notes in common, so they result in a much more complex sound that’s still made up of very simple components. Really, I see it as the metaphorical polar opposite of melodrama; just as a writer would present contradictory elements in a character’s personality, “round” versus “flat”. Otherwise there’s no tension, no surprise, no catharsis. So, yes, the high level of ambiguity in my music is intentional, but that sort of thing works better in some genres than others. I find that it’s probably why people describe my music as “cinematic”. Koniuto: The first time i heard and saw you perform live was in Lawrence, MA—maybe ten years ago now. You were performing in a small ensemble accompanying a film—yes, actual film with projector and screen. Talk a little more about your music’s relationship with film, historically and currently, as well as how film has played a role in inspiring what you do with sound. tn: I don’t know where to begin with this one, it’s so central to the way my brain seems to be wired… Like I said, I’ve always heard musical textures sort of synaesthetically spilling over into or from out of other areas of narrative, or maybe as expressing the same themes as a visual might but in a different sort of metaphorical language. Sound, light, movement; they’re all inseparable to me, whether they’re parallel or in counterpoint, all dramaturgical expressions in various idioms. But for that show you saw in Massachusetts, the music and the film were entirely asynchronous and unrelated. I couldn’t even see the screen from where I was standing as I played; the footage was some old films from NASA, random stuff that one of the other musicians had gotten ahold of somewhere. Koniuto: Just knowing it was there had to have an impact on the music you were creating, though. You were effectively in a makeshift movie theater. tn: It does bring up an interesting factor that does bear directly on my music. I’ve never really thought of myself as a frontman, someone with the type of charisma onstage that commands your attention and makes you want to watch them. In an ensemble setting that wasn’t a problem, as I would very naturally slip into the supporting role. But when I perform solo, which through the technology of digital looping gear is the main way I’ve done live shows for years now, I feel very ill at ease standing up there being the visual focus when there’s not the luxury of having a film projected for people to look at. So what happens is that in places where the music might have a greater range from sparseness to density, there’s a tendency towards this big monolithic mass of sound, as if to say, “Don’t look at me, listen to this.” With film music, it’s an entirely different story. The visual needs room to breathe. There has to be silence, silence as an integral part of the music. So I’ve consciously been trying to move in that direction. A big influence in that regard, not that you can really hear it in my music, has been in listening to a lot of Morton Feldman in the months before I wrote Pellucidity, a composer infamous for placing very small events in a context of silences, and of having change take place very gradually over very long pieces of music. Another big influence on this album has been Giacinto Scelsi, with whom I identify on many levels. Koniuto: I know little about Scelsi. I remember hearing a few pieces—one for solo piano, maybe another one for solo trombone—with very long rests. The music was basically rests!—with the occasional sliding note or chord puncturing the silence. You end up noticing every detail because there aren’t many. How did you come across Scelsi, and in what ways do you identify with him? tn: Like Feldman, but at the same time in a very different way than Feldman, much of Scelsi’s music is known for sparseness and economy, for change that only reveals itself gradually. He went through phases where he’d try to wring everything he could out of a single note, letting the sound decay so that the overtones that would emerge, which would normally not be heard over a busier melodic content, would become the basis of the music. So in that way I sort of see those two composers as an antidote for my tendency to want to fill everything up. But another way that I feel drawn to Scelsi is through what I suppose I could describe as his “outsider” status regarding his acceptance, or lack thereof, by the established conventions of genre. He didn’t fit in. One of the ways he liked to work was to record improvisations at the piano and then have copyists transcribe the best bits per his instructions. He was an Italian count, actually, so he could afford to work that way, but it absolutely enraged most people who found that to be outside their definition of composing, but didn’t seem to actually listen to the results, so much that he’s only relatively recently begun to get the recognition he deserves. Koniuto: We’ve talked about music for film, and generally music that sounds cinematic. The aesthetics and approaches can be diverse. You’ve mentioned a few influences—are there other specifically film score composers who have had an influence on you, other than Torn? Another area where the cinema has been a very important point of reference to my music, especially where I’ve written very simple parts to be played on instruments that I don’t play well at all is, metaphorically, like the difference between a matinee idol and a character actor. On the one hand you’ve got the handsome hero who might equate to an instrumental virtuoso, while on the other hand there’s the underdog with a storied face and obvious limitations who just might unexpectedly transcend the inevitable and surprise everyone with a truly emotionally moving moment. That’s a very special flavor of pathos. Koniuto: Right. If you’re not Anouar Brahem but you’re playing the oud, the music is less concert hall and more a character unexpectedly finding herself on a street she’s never been on before. Is this a technique you’ve always consciously employed, or one you discovered was occurring naturally and you decided to capitalize on it? tn: I think it was occurring naturally right along, but it really became clear to me through doing film music, where there were a few times when I’d submitted several different versions of a piece and was kind of surprised when the directors would express a strong preference for a version that I thought was technically inferior in terms of my instrumental performance but which more appropriately suited the mood or tone of the film. That switched on the light bulb hanging over my head. Aha! Koniuto: Two of my favorite instruments!—especially when they’re featured in the foreground. Koniuto: Zen Mind, Beginner’s Mind is a very powerful little book. I don’t think i’ve heard your clarinet and viola album, though. tn: I’m not going to release the album in its full form as a good amount of it’s not particularly listenable, but it definitely sparked a lot of the ideas that were developed more fully on Pellucidity. In fact, one of the things that did show up was when I made a set of clarinet samples where I recorded each note of the clarinet’s range by itself, one note at a time. On Pellucidity, the fifth track, ‘collige virgo rosas’ uses those samples, so the “composition” happened independently of the “performance”. I had done the same sort of thing on Strange Birds on the track ‘gli strani uccelli con voce umana’ but with vocals; it’s one of the few choral pieces I’ve done where all of it is my own voice, rather than using Mellotron, or as I more commonly do, some mixture of both. 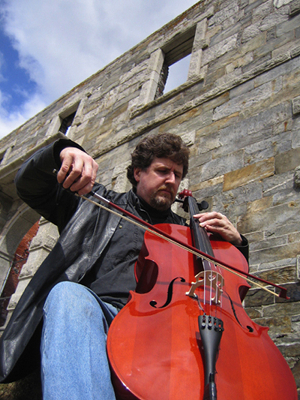 Koniuto: Do you think being a coastal New Englander has had an impact on your music in any way? The ocean, the extremities of the seasons, the high winds, the rocks and beaches of the coast, the green, the salt air, the history—do any of these play a role in reading your creative compass? tn: I don’t think so. Maybe. We’re all a product of our own circumstances and, yes, the sea is a very large part of the secret storyline behind this album, but it’s not the same part of the world or even the same millenium. It’s definitely not set in New England. Koniuto: I don’t like to pry in to artists’ private lives too much, so share only what you’re comfortable with. Your spouse is an artist. She’s a sculptor and a writer and tool-maker, she’s also a jewelry designer, among other things i’m sure. How—if at all—have the paths of your creativity crossed? I mean, lots of artists will say of their lovers, “She’s my muse, she’s my inspiration,” or, “He supports me so much, and he keeps me going even when I’m not sure I believe in myself.” I sense from what i know of you and from your spouse’s CV that it might run deeper than that. tn: I’m glad you asked about that, as I’m generally reticent to talk about personal matters in public and wouldn’t have thought to bring it up here. But, yes, it’s incredibly important to me to have someone in my life who doesn’t negate my creative energy or attempt to guide it, and people do need to know they’re appreciated and of course I don’t tell her nearly enough how much I do appreciate her in so many ways. Yes, Kate, being an artist, is easily able to recognize when I’m, as she puts it, “in creative mode” or “in the zone”, as I tend to be for several weeks before beginning a recording project, and allows me the space I need. She’s not a muse, which really is a good thing considering that so much of my music explores darker emotions than I’d like to associate with Kate but neither of us feels it’s her job to be my muse; we don’t have the same musical tastes and we do respect each other’s autonomy. The inspiration she provides isn’t directly relevant to my music, but is instead more of an example of how an artist is supposed to move in their own direction, guided by their own personality rather than by any sense of conformity to what is expected. Like I said, she doesn’t try to influence my music, which is fortunate because, and this is going to sound corny, when I compose I sort of immerse myself in the psychopathology of it like a Stanislawski method actor might, which can be utterly grueling. So when I leave the studio I’m pretty frazzled and completely exhausted in a way that a non-artist would have trouble understanding, and her positive energy is both infectious and restoring. Also, her studio is downtown, while mine is in our home, so obviously if she were not as patient and as tolerant of how fragile creativity can be or the requirement for complete silence when using a condenser mic it would be impossible, or at the least very difficult for me to get any work done. She’s been writing a novel for a while now and fortunately is able to write while I’m working, so she’s being very quiet and she says she enjoys hearing what she calls her soundtrack. We’re both very much attracted to creative energy and that’s really the foundation of our relationship, the way we inspire each other, not so much with specific things but just by the importance we each place on mutual respect and for cultivating a creative environment. Koniuto: Looking forward, is there something compositionally you haven’t attempted yet but that you’re eager to try to do? tn: I think in describing my modus operandi I may have put more emphasis on the whole DIY aspect than is really the case. I’m really not attached to always doing everything myself, but have settled into working that way because logistically it’s been the most natural course, and those limitations have certainly been influential to my style. I can definitely imagine, though, that more and more in the future I’ll be scoring parts for other, more capable instrumentalists to play, just to realize what I’m hearing in my head on instruments I can’t even begin to handle. I mean, I’m not entirely uneducated in music theory, but at the time when I was taking any formal training I really couldn’t imagine ever needing to write parts for anyone else to play. At the time, as an instrumentalist, I was much more interested in what couldn’t be notated. So I’ve sort of come full circle, taking a circuitous path, reinventing a lot of wheels, and it’s only now that I’m starting to feel like I’m ready to undertake trying to score the music that I’ve always imagined. I’ve been listening to a lot of choral music lately, and for where I want to head in that direction I’m probably getting near the end of what I can do with the Mellotron. Koniuto: Knowing what i already know about you, and in light of this conversation we’ve been having, can you let me in on a popular film you’ve seen recently that might surprise me you enjoyed? Tim Nelson’s solo music can be found for purchase by clicking here. The air conditioning in the studio was engaged today. First time of the year. I don’t usually diary these things; this could be a record. Perhaps i should diary each year the amount of time between the heat system finally goes into hibernation and the cooling agent is called into the room. Each affect the air differently, and therefore the sound—to say nothing of the pacing of a recording session. A work itinerary consideration. But it is early this year. Hot Saturday. In the Christian book, it’s the day before the resurrection of the Divine, the day after the seed hath died and before the tree has yet to sprout again. A day of waiting. The last day of sacrifice. Tomorrow’s a new day. It’s a day to stop concentrating on what we gave up, and start feeling what it’s like to be givin’ it up. It’s a day many folks can eat chocolate again. We find the divine where we can. Pour it on thick: the heat has arrived and the goodness melts all over us like sin become a blessing. That’s supposed to be tomorrow though. All said, i wonder what will happen at Red Sun tonight.